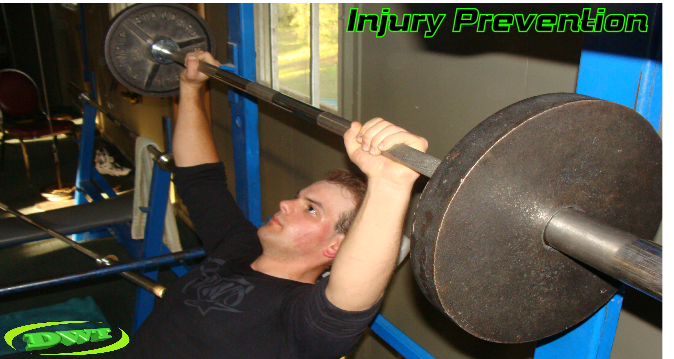 Weight Lifting Injuries and Prevention! Weight lifting injuries: as with all sports and fitness lifestyles, there is always the possibility of a nagging injury occurring. As each and every time we leave our home, getting out of bed or off the couch, this risk will increase. Whether you’re power-lifting, cross or circuit training, bodybuilding or weight training try to observe the fact of preventing weight lifting injuries. learning and educating yourself on the importance of avoiding weight lifting injuries altogether is a great first step. Warming Up Is It Important ? There are reasons for weight lifting injuries happening for no good reason, some of these are going to come in the form of lesser inexperienced lifters, simply over lifting at their level. Recklessness or a blatant disregard for form or excessive cheating can also be culprits directly related to weight lifting injuries. Warming up can be just like your weight training if you use your imagination; break it up, and always change it to keep boredom at bay. Or warm up with 40 to 50% of the weight associated to the muscles and joints that you’re training that day, for a few warm-up sets. This will go a long way toward helping prevent most weight lifting injuries. A small note here is: this is a warm up try not to overdo this, you are going to need your precious energy stores to get you through your workout. As far as preventing weight lifting injuries goes, one of the most overlooked things that are rarely done before or during the workout, is the ability to stretch. Stretching is a very basic form of exercise that the bodies muscles, ligaments, tendons and joints need, this is fact not fiction. Stretching should be viewed as a small part of each of our lives even if you’re not athletic. Stretching allows the muscles, tendons and the joints they assist, allows a degree of softening to the different fibres, making them more supple or malleable. By stretching your chances of incurring any weight lifting injuries decrease sharply. Muscles are wrapped in a small thin tissue called ‘fascia’. The fascia acts as a supporting sleeve for your muscles, but as we age. This sheath will begin to harden somewhat over time, and can restrict muscle growth. Stretching your major muscle groups and warming them up properly allows this sheath to become more supple and expand easier. Some athletes can experience muscle and tendons that actually become bound: generally, this usually happens early on in a weight lifters career, (I have experienced this myself). This is usually from lack of stretching (4) places that maybe most prone to this could be: the Forearms/Wrists, Shoulders, Calf muscles and Lower back. I always found after a few weeks of consistently stretching; this discomfort from training was alleviated to the point where it became nonexistent. Having discussed how to avoid weight lifting injuries; let’s discuss what an injury actually is without going into too much detail. As a beginner the cause is generally going to be from excessive effort, over exertion or poor form. The center of the muscle belly which is the thickest part of each muscle, is not necessarily what is usually injured. It’s often tendon or connective tissue, these insertions to the bones and the anchoring system of them that assists the muscle groups are the most prone to injury. Luckily, our bodies possess very sensitive sensory receptors, where legiments and tendons join to bone. This sensitivity is part of the nervous systems ability to protect the body with an early warning system, that defines the early stage of an injury and warns against (continued action could inflict greater damage), to that of a major tear. If you do incur an injury stop working out. Assess how bad it is, if there’s swelling, applying ice is probably a great first step. You don’t want to freeze this area just cool it to bring swelling down, If the injury does not slow in its discomfort and swelling after 1 or 2 hours, it’s probably time to see your doctor. Most of the time with most injuries a few days even a week or in some cases two at the outset usually heal. Light weights and slowly rehabilitating the injured area is generally the best and safest first step, toward this healing process. When you return to the gym, go-easy, you may even need to softly wrap a tensor bandage to add support to the injured joint or area as your training It. For the most part: the highest percentage of injuries happen in the bodies joints, such as: knees, shoulders, elbows etc., this is often because these are the weakest links in the compound-lateral-plane that the limbs move through as you lift. The three biggest joints, starting with the first one, that can be the most prone to weight lifting injuries is the shoulders. One of the biggest reasons this particular joint sustains injury and sometimes easily, is because of its range of motion. The shoulders have a rotor cuff giving incredible mobility of this joint, anything to do with chest, shoulders or arm exercises, are all reliant on this joint. Always warm-up the shoulders thoroughly, I share this with you because of my own experiences with this joint. The second body part discussed here can also be common to injury is the knee joint, this particular joint has strong tendon attachments. 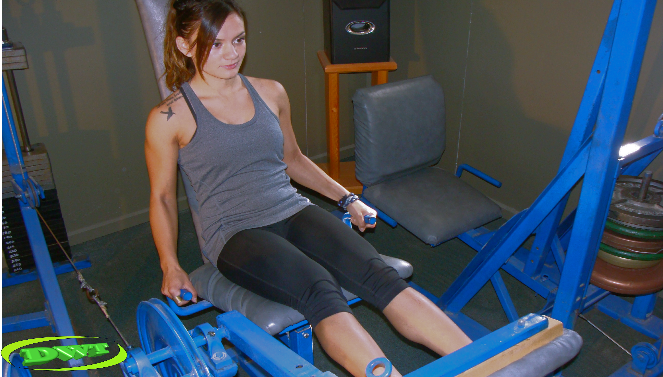 The knee is capable handling 400 to 500 pounds in a squat or leg press, but this is only possible because of the larger more powerful muscles that reside in the legs. The third joint that deserves equal attention that can really hamper gym efforts are the elbows, with these injured as with the shoulders; workouts can and will be hampered, to what level is hard to say, as this will depend on the level of the injury. One further mention of a final body part that volumes of books have been written on is: the back, specifically the lower back. This is obviously where the upper and lower body are attached, creating our center of gravity. The forces that act on this center in everyday life can be strenuous, even mental stress effects this particular body part. You might ask; is this even a joint? In point of fact, it actually is and complicated, mechanically speaking. This is a strongly neglected and in many cases recklessly cared for body part. The lower back can be far more debilitating than any other injury you can sustain on the body. Even a small injury can leave you completely bedridden, even missing work, never mind weight training. This body part is mentioned on its own because of its own importance. Almost nothing wrecks a day worse than a sore back, or one that’s been overworked. As far as joints go to be honest here I’ve temporarily injured all of these that I’m going to discuss with you, including my back. These were never anything I couldn’t come back from and most of these weight lifting injuries were small in nature. But... please, if I can give you nothing else in the injury section; Please take the time to warm up your back–especially the lower specifically. When you have anything to do with training legs, such as; squatting, dead lifting or bent over rowing, using barbells or dumbbells, always use good form and caution. Even in the beginner’s level, a weight training belt applied during these exercises, after a good lower back warm-up should be considered. I discourage the use of the belt for the easier exercises, as you do want your lower back to get stronger with time and training. The weight belt does have its place, but it is for the heavier-compound exercises, that adversely affects the lower back. Overuse of the belt - overtime, will actually weaken the lower on less strenuous exercises. Again, use your own understanding of your body and use it where you think you it's needed. The difference between muscle fatigue and actual pain is; just that...PAIN! Muscle and joint pain are sharp, this pain gets your attention immediately! You don’t have to guess whether it’s there, or not; if you’re feeling this on every rep in every set. This is pain and body will usually force you to stop! The less reckless you are in the gym, the more sensitive you'll become with your body and your ability to sense when it’s had enough, and when it’s time to back off and give it rest. If your a beginner and wondering if it’s hard to distinguish from any weight lifting injuries, or muscle fatigue. Trust me, there’s a difference and it’s huge, muscle fatigue dissipates probably by 50 to 60% after approx. 20 to 25 minutes of rest from the time you've finished your work out. Depending on how hard you’ve trained usually a couple of days after, at the outset for the last of it to disappear. This occurs naturally as the muscle heals itself. Muscle and joint pain will last much longer. Remember: when you train the ego it does not need warming up - but you do! Our bodies are not machines; they’re organic living, breathing, always evolving and very complex organisms. Train with the strictness of a precision machine, but always listen to training stimulus to avoid training injuries. 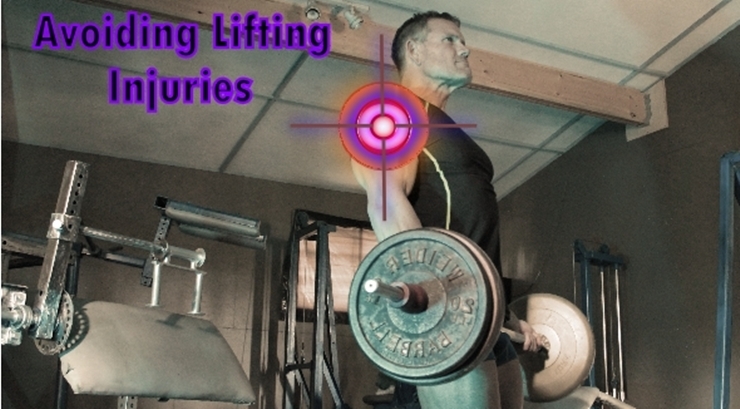 Respect your lifting level, and understand that injuries can occur. I have lost count from years of training, and injuries sustained; they were generally small in nature and I came back from most of them quite quickly, often the injuries were the fault of my own, not the fault of weight lifting itself. By performing a good warm-up and stretching as suggested, you will inevitably eliminate a lot of this; if not almost entirely from your training. treat your body like you do everything; with respect - and it will be there for you, for years and years to come. I wish you the best with your weight training and your efforts towards preventing weight lifting injuries and training towards never-having one.